I received product for this post from Smiley360 in exchange for my honest review. All opinions are my own. The holidays are history, but sadly the stomach pain from all of the overindulgence is not. The last two weeks have been filled with travel, gatherings, and lots of things to keep us busy. It seemed that almost all of it revolved around food and typically eating too much or eating things we normally don’t allow ourselves to indulge in. Between on vacation, Christmas Eve and Christmas Day family gatherings, 3 little boys with a stomach bug, shopping and dinners out with friends, and our New Years Eve trip to New York City, our family’s stomachs have not seen our normal routine in weeks. I know by the time my husband and I arrived home from New York yesterday, we were both feeling really miserable. I let myself have gluten and corn and other foods I normally avoid and my husband had just a little too much of everything. We were beyond thankful to reunite with our Pepto-Bismol when we got home! Today we’re recovering from post-holiday stomach pain. 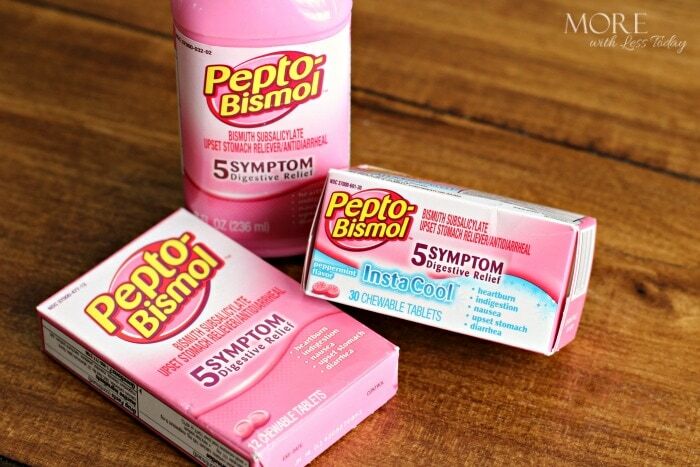 Pepto-Bismol has been around for as long as I can remember. I can remember it in the medicine cabinet as a child and my mom turning to it when one of us was not feeling well. It’s known for it’s 5 Symptom Digestive Relief – heartburn, indigestion, nausea, upset stomach, and diarrhea. I won’t go into detail about what we were feeling when we got home last night but I’ll say that the Pepto-Bismol had us covered. We were feeling much better quickly so we could enjoy being back home with our kids. 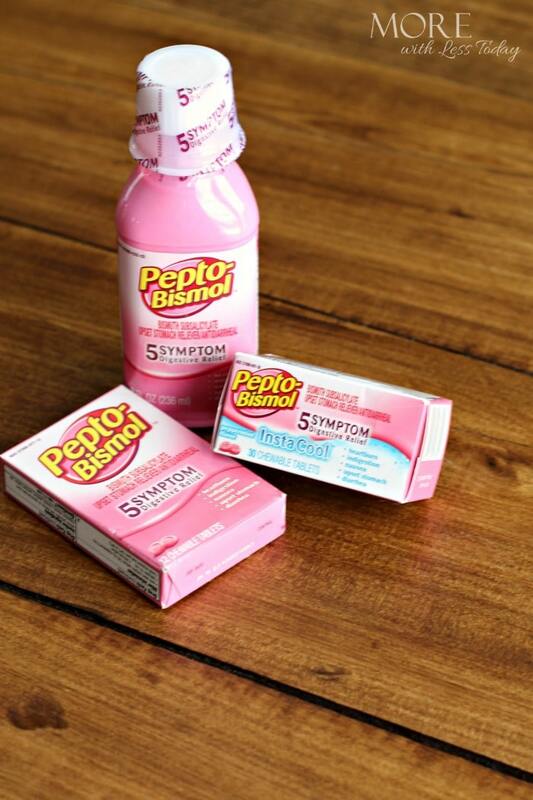 Pepto-Bismol is great to have on hand for not so great feeling stomachs. To help your stomach feel better quickly and begin recovering from post-holiday stomach pain, I’ve put together some helpful tips in addition to keeping the Pepto close by. When you’re stomach isn’t feeling well you want to stay away from foods that will only make matters worse. As a mom I first learned about the BRAT diet when my oldest was a baby. The BRAT diet isn’t just for babies and kids though. It’s perfect for any stomach that’s recovering from not feeling so well. Made up of Bananas, Rice, Applesauce, and Toast the diet is easy on the stomach. These foods won’t aggravate your already irritable stomach. When your stomach isn’t feeling well and you’re experiencing cramping and bloating a heating pad can ease discomfort. Whether it’s a hot water bottle, an electric heating pad or blanket, or a homemade heating pad snuggle up and give yourself a chance to recover. This is pretty self explanatory. Staying hydrated is so important when your stomach is not in great shape. Lots of water will also help flush your system of all the ick that is making you sick. While water is best there are other fluids that are good too – try drinking warm broth or teas too. Chamomile tea can be especially helpful. Add a little peppermint oil or fresh peppermint leaves to a cup of boiling water. Let the water set for several minutes and sip. The peppermint can help relax stomach muscles and aides in digestion. Adding lemon to your water instead of mint can also aid in digestion of your food. Regardless of what’s caused your stomach pain between these tips and Pepto-Bismol you’re sure to be feeling better soon. As for us, someday we’ll learn not to overindulge or eat things we know we shouldn’t but until then we’ll keep Pepto-Bismol in our medicine cabinet. 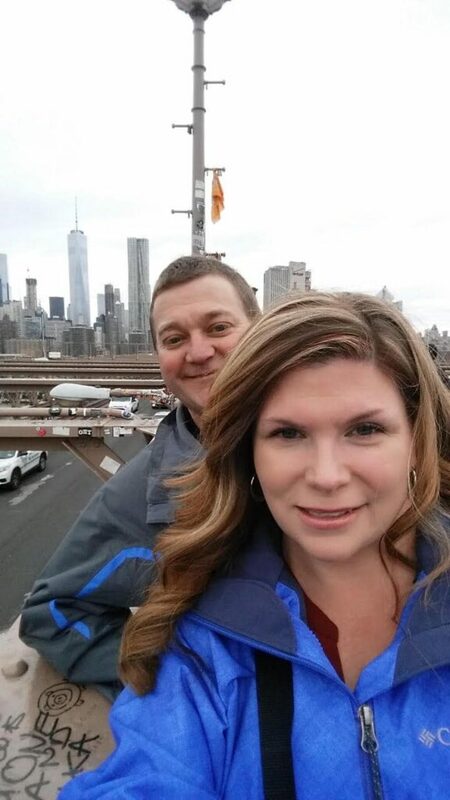 Here we are in New York City last week after another delicious holiday meal taking a walk across the Brooklyn Bridge. What is your go-to remedy for post-holiday stomach pain? Fortunately for me a glass of milk is all it takes to calm down an upset stomach. Hopefully that will always work as I get older! I like to keep a pack of Pepto-Bismol on me at all times. You never know who or when you’ll need it. In fact, it would have come in handy over New Years. My cousin needed some and no one had any (including me). It’s definitely would have come in handy. Pepto-Bismol is a name I trust. I keep a bottle in the cabinet in case it is needed. We always seem to need the Pink Medicine! We have used Pepto-Bismol for many years. It is a brand that I trust. The holidays can be hard on our stomachs, it is nice to know there is a trusted item out there that will help. My daughter always had some while in college – she would often be stressed and eat badly and Pepto was there to calm her stomach! I miss my pepto, it’s on the no list for pregnancy. I definitely could have used some after my third Christmas dinner! I use Pept as well. I never had any stomach issues until after I had my son – now it’s always in our medicine cabinet for after big meals. I have tons of digestive issues. Over the years, I’ve come up with a few tricks to help. Personally ginger ale is a great item to always have in the house. But, Pepto is great when traveling.